Happy National Pretzel Day! Yes, there is a special day dedicated to pretzels. I am A-Ok with that because I love pretzels. I’ve always been a fan. In grade school, I always brought a brown bag lunch to school. I always asked my dad for a peanut butter, banana, & honey sandwich, an apple, and pretzel sticks…and of course a cookie for dessert:) I love salty pretzels in any shape or form. My new favorite pretzels are these homemade soft Rosemary Sea Salt Pretzels. They are fantastic! Josh is the pretzel master at our house. He always makes them and I eat them. It’s a rough job but somebody has to do it:) This time he added fresh rosemary and sea salt to the dough. The combination is awesome! They are good plain, but he made a rosemary cheese sauce that knocked my socks off. I loved dunking my pretzel into the cheese sauce. The pretzels are really easy to make. I promise. Don’t let the yeast and twisting the dough scare you. They are fun to make and eat! 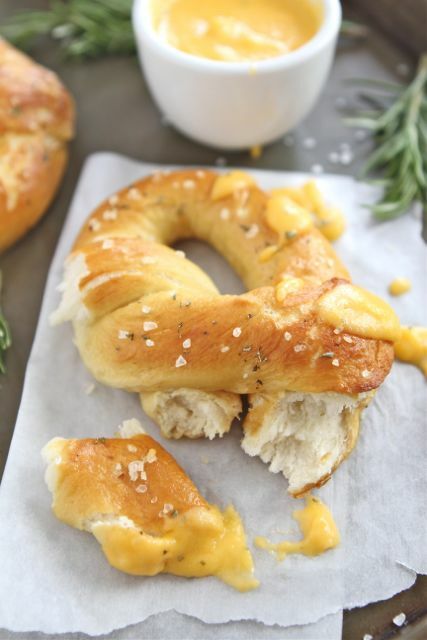 Celebrate National Pretzel Day with these Rosemary Sea Salt Pretzels. They make a great snack! Here are a few other pretzel recipes to help you celebrate National Pretzel Day! Enjoy! Soft homemade pretzels with fresh rosemary and sea salt. Dip them into a rosemary cheese sauce for a great snack! To make the pretzels: combine the water, sugar, yeast, and butter in the bowl of a stand mixer and mix with the dough hook until combined. Let sit for 5 minutes. Add the salt, flour, and rosemary to the mixture and mix on low speed until combined. Increase the speed to medium and continue kneading until the dough is smooth and begins to pull away from the side of the bowl, about 3 to 4 minutes. If the dough appears too wet, add additional flour, 1 tablespoon at a time. Remove the dough from the bowl, place on a flat surface and knead into a ball with your hands. Coat a large bowl with canola oil, add the dough and turn to coat with the oil. Cover with a clean towel or plastic wrap and place in a warm spot until the dough doubles in size. This will take about 1 hour. Preheat the oven to 425 degrees F. Bring the water to a boil in a large pot. Remove the dough from the bowl and place on a flat surface. Divide the dough into 8 equal pieces. Roll each piece into a long rope. To shape into pretzels, take the right side and cross over to the left. Cross right to left again and flip up. Slowly add the baking soda to the boiling water. Boil the pretzels in the water solution, 2 at a time for 30 seconds, splashing the tops with the warmed water using a spoon. Remove with a large flat slotted spatula or a spider. Place 4 pretzels on each baking sheet, brush the tops with the egg wash and season liberally with sea salt. Bake for 15 to 18 minutes or until pretzels are golden brown. To make the Rosemary Cheese Sauce: In a medium saucepan over medium heat, melt butter and whisk in flour. Pour in the milk and whisk until the mixture thickens. Stir in shredded cheese, stir until cheese is melted and smooth. Stir in fresh rosemary and season with salt and pepper, to taste. Serve with pretzels. I love homemade pretzels and yours look marvelous! What great flavors. So droolworthy. Gotta try these pretzels! I love the pretzel breads but not so much the sticks unless they’re coated with chocolate or yogurt. Pretzels are such a fun food to make! I love the rosemary theme here too…yum! I tried to make GF/DF soft pretzels once… Okay, I tried five times and none of them were that good. I am jealous you can make them yourself! I will need to try again one of these days. 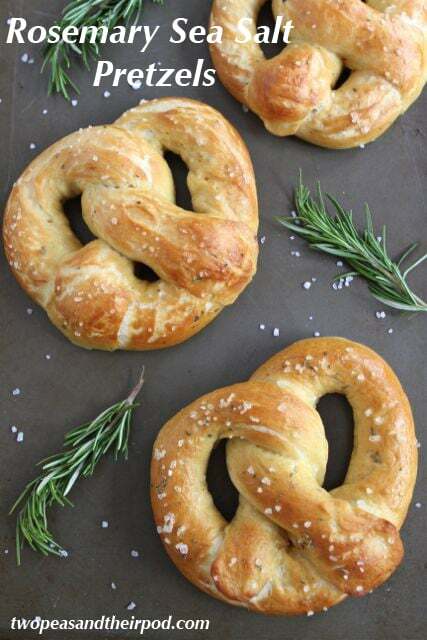 Yum, rosemary is one of my favourite herbs and it works so well with the salty pretzel! oh my! 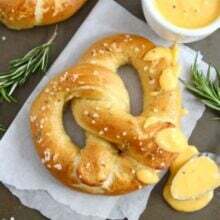 I LOVE big, soft pretzels..even better when they’re dunked it hot gooey cheese sauce! These pictures are giving me a killer craving! These might just have to grace my kitchen (and mouth!) soon! Thankss!! 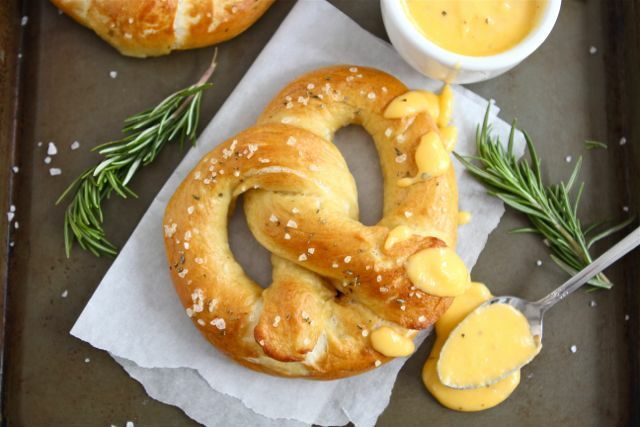 Oh my, soft pretzels and cheese sauce sounds amazing! Aww yeah, such a classic, delicious idea!! Pretzels and cheese make me a happy, happy, girl! I never knew there was a national pretzel day! Thank you for sharing this crucial piece of information 🙂 I love rosemary and salt as flavoring and the cheese sauce sounds like icing on the cake. These do look like fun to make and dipping tim in cheese sauce infused with rosemary is inspired! I’m just wondering… Chopped rosemary is listed as an ingredient in the pretzels, but I don’t see where in the directions you add it. ?? Thanks for catching that! I updated the recipe. You add it with the salt and flour:) Thanks! Ooooeeeee. These look amazing. I made rosemary sea salt rolls at the weekend – LOVE the combo. Have you tried making focaccia from scratch? Its so addictive! These look perfect! Wish I could bite into one right now! Those look fabulous!! Glad I have rosemary in my backyard, because these WILL be made tonight!!! They look beautiful and delicious! 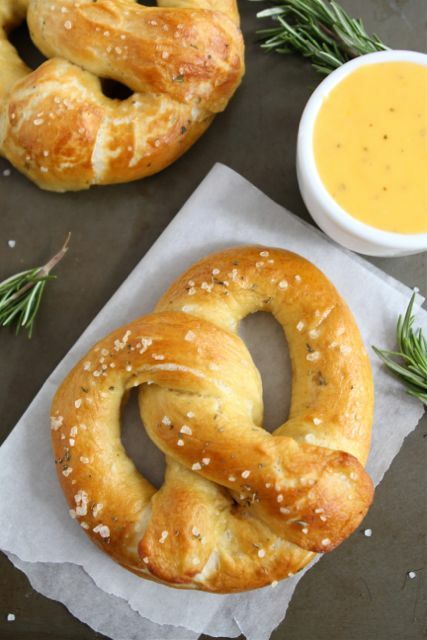 I love soft pretzels and the addition of rosemary sounds great. Hey Josh, would you like a vacation in Mexico City? Hehe. These looks perfect. I’ve made your pretzel bites and they were devoured. Can’t wait to try these. these are beautiful! I have yet to make my own pretzels yet. Gotta try some! Although anything with yeast scares me, I need to try these especially with all the rosemary in my garden. I *love* thick warm pretzels! I’ll have to give this cheese sauce a try sometime. I am sad, I didn’t know it was national Pretzel day and I LOVE pretzels! I guess that means I should whip up a batch of your pretzels tonight! They look amazing! These look amazing! I am always looking for new recipes for the rosemary I have in my yard. I can’t wait to try them! Holy moly do these look good! I think you need to give me a lesson in pretzel making! The rosemary just makes this for me. It’s one of my favorite herbs and I’ll eat it on anything. It’s so perfect for pretzels and cheese. This is truly unique, Maria! I’ve never had such an insane craving for a pretzel before. I’ve always wanted to try homemade pretzels before. YUM! Pretzels are not common here in Peru, we only can find the “crackers” one, those small and crunchy that comes in a bag, you know what I mean? (little bit difficult to express in other language), but I love the normal pretzels, when I traveled to the US I couldn’t resist to have some, of course, from a mall, but I’m sure that the home made should be the best. I have to try this recipe. I love pretzels and can’t wait to try this version. I made baked rosemary and cream cheese savory donuts awhile back and this reminds me of those. But there is just nothing like a pretzel and these look incredible! My rosemary bush is chock full of tender new growth and we love pretzels! Guess what we’re having for lunch today. Thanks for the post, they look great! Mmm, I love pretzels. Definitely making these with the kids on Sunday. Who doesn’t love a giant soft pretzel? The addition of rosemary sounds amazing. My favorite bagel is a rosemary olive oil bagel, so this sounds right up my alley! these look just like what Esi from Dishing up Delights made. Did you get the recipe from her? I loooove pretzels, especially soft ones. These look amazing! I can’t wait to try these! I love the combination of pretzels and cheese. Sad to admit it, but I ate these about 1-2 times a week when I was in high school. It will be fun to relive the memory! These look so good!!! But I have to ask…I have never seen a recipe with 2/3 cups of baking soda. That seems like so much. Maybe it’s a pretzel thing, as I’ve never made them before, but I wanted to confirm before I make them. Also, have you ever tried this without egg? Any suggestions? Thanks!!! You do need the 2/3 cup baking soda when you boil the pretzels. I know it sounds odd, but it works:) I haven’t tried without the egg. I just answered my own questions. Lol. Please disregard my previous post. Well, just the questions, not the part about how good they look!!! Oh my goodness these look delicious!! I love rosemary!!! Oh. My. Goodness. I really, really wish I could make these right now. Yummmm! I love rosemary so I know I’m going to love these pretzels! Can’t wait to make them and that delicious cheese sauce, too! These look incredible. I have a confession. I’ve never had a fresh large pretzel like this. No idea why. I’ve just never been to places where they sell them. I must try this. I have a feeling I’ll fall in love with them and it’s all I’ll want to eat. I have never made pretzels before, but that needs to change asap, because these sound phenomenal!! mmm soft pretzels!! I am definitely going to try this recipe—thanks Josh and Maria! ahhh so yummy!! I love fresh homemade pretzels. and rosemary is an awesome flavor addition! Are you kidding me!? These look fantastic… I can not wait to try this recipe! These look so freaking amazing. I love the gourmet twist on pretzels. I could definitely go for one as an afternoon snack! I have a question. Can you make these with whole wheat flour. Scared to switch but my girls have a problem with white flour. Thanks. They sound so delicious. Don’t want to make them to eat all myself, lol. I haven’t tried whole wheat flour, but I am sure it would work. Enjoy! OK I just added the ingredients, changed a bit up because I was out of butter and had no fresh rosemary, to my bread machine YES I KNOW but I live in a cabin and it is just really hard to move stuff around and I have less stuff to clean! With no running water it makes my life easier. We will see oh and instead of rosemary I am using my rosemary lavender blend. YUMMMY AGAIN! I love pretzels too! I like to get them at baseball games and amusement parks. So good. These pretzels sound amazing! Rosemary adds such a wonderful flavor to everything. Nice post. These look delicious – the cheese sauce is the perfect addition! I have homemade pretzels on the to-do list this month, I always know I can count on your recipes, thank you!! i love making homemade pretzels, but i don’t know how to store them! how do you keep them delicious after the first day? These look like the most perfect pretzels EVER. My first dabbling in the world of soft pretzels occurred two years ago when I made pretzel rolls…SO GOOD. i think these pretzels would top them though. I love rosemary in bread form! Hi. Lovely blog. I’m wondering what the weight is of a package of US dried yeast? Not sure if Australian yeast comes in the same-sized pack! Cheers. I made these this evening, but instead of rosemary used other seasonings I used- (italian seasoning, garlic powder and onion powder). Followed directions otherwise exact as stated and OMG perfection. They came out looking just like the pictures!!! Cheap to make, better tasting than any other pretzel I have ever purchased and really super easy. I’ve never made pretzels and until 2 weeks ago, was terrified of yeast. Mega stars for sharing this! Oh my gosh I love these! I made homemade pretzels once and they weren’t as difficult as I thought…I have to give these a try. I especially love the homemade cheese sauce! Yes, we’re making some of these really soon. AND the rosemary cheese sauce is on the list as a keeper for other things too! 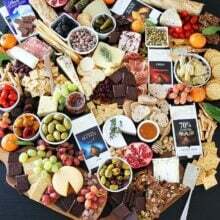 This is one of the yummiest things I’ve ever seen on a blog! Maria I adore these. I may have to make a spin-off recipe this weekend! They look amazing! Maria, these look amazing. Love that there is rosemary on the pretzels and in the sauce. Yoooooo these look ridiculously good! I am a HUGE fan of salty pretzels with cheese dip. OMG dying… !!!!! Looks lovely – any thoughts on freezing and defrosting these wonderous pretzels? Pretzels and smoothies for supper tonight. Can’t wait. The dough is rising. It looks dreamy already. I have yet to make pretzels, but these sure look great. I will have to give it a shot soon. Thanks for linking up again Maria!! Those look crazy good – love the rosemary!!! Your pretzels look so perfect – I’m very impressed and wish I had one right now! 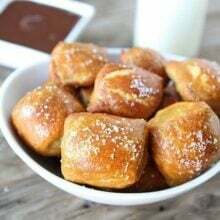 I’ve never made pretzels before, but these look so yummy that I’ll have to give this recipe a try. Thanks! Fun. I made these last year. So good. Wow!! Are these ever delicious!!! And easy too. Will definitely make these again. I can’t believe I made these! They are not as difficult as I always thought they would be! Thanks for the recipe. Oh, and they are delish! 2 1/4 teaspoons. I updated the recipe! Enjoy! Yum, these take me back to childhood. What a fresh take! Thanks for sharing. Do you happen to have a gluten free pretzel recipe? A friend of my daughter’s is extremely allergic to many foods including gluten. Do you have a whole wheat flour option? Substitute 1/2 the white flour for wheat maybe? Also, can you suggest any other add-ins? I made the Rosemary and it was OUTSTANDING and am ready to make a different kind. Thank you. I love pretzels in every shape or form. I can easily see these becoming a favourite this side of the screen, thank you! These sound soooooooo good. I dont have a stand mixer, do you have any clue if this would work in a bread machine? Also, I noticed on the Pretzel Bites recipe, the cheese sauce measurements are different. Which one do you prefer? Thanks!! I can’t wait to try this recipe for many reasons. Reason #1 my son has a huge rosemary bush in his yard, free ingredients. woohoo! Reason #2 I love any recipe that I can make with my gbabies. They are 12 1/2 and 6 1/2 and both love to cook w/ their Honey. Reason #3 They look delish and seem easy enough for my gbabies to make. Tonight is first time I have seen your site. LOVE LOVE LOVE IT! I have added it to my favorites and plan to look through all ya’ll recipes tomorrow after the girls go to school. Welcome! Glad you found our site! Hey! Do you think i could do the dough in my bread maker?? I haven’t tried using a bread maker, but I am sure it would be fine! These look so yummy! I need to get over my fear of using yeast! Michele asked if the pretzels could be made without an egg. I was told, by a grandma who’s grandchild is allergic to eggs, that most recipes can be made without the egg if you add 1 tablespoon of white vinegar in place of every egg required. I once needed 3 eggs for cupcakes and only had 2 in the house. 2 eggs and a tablespoon of white vinegar later – perfect cupcakes and no vinegar flavour detected by anyone!! I don’t know if it would work with this recipe (am about to make pretzels for the first time with my son who loves them thanks to this recipe :D) but it’d be worth a try. BEST PRETZEL RECIPE EVER! Thanks! Oh and for everyone else that asked, I did use the bread machine to do the kneading – I mixed step 1 by hand and poured into the pan, sprinkling the yeast on top. Let it sit 5 minutes, then added the rest and turned it on for about 10 minutes, until it was smooth. Turned out perfect! I made these twice now…in one week!! The first time I didn’t have any rosemary but they were SO delicious and the 2nd time made with rosemary and they were just as yummy! Split the sauce in half and added a couple spoonfuls of marinera to make 2 diff sauces. Thank you so much for a great recipe!! It’s definitely a keeper! These are amazing!!! They turned out so good and the rosemary….OMG! The only mistake I made as a newbie to working with yeast is leaving the dough wrapped in plastic wrap on the counter as it rose. It started to expand all over the counter. lol I moved it into a bowl to continue rising and problem solved. I added this recipe to my pinterst account and blogged about my experience. Glad you enjoyed the pretzels! 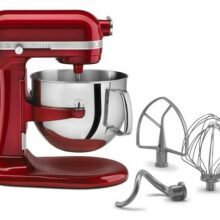 What kind of mixer should I use if I don’t have a stand mixer? Thanks!! You can work the dough by hand if you don’t have a mixer. made these tonight after seeing them on pinterest…they were awesome! i made half as pretzels, and half as pretzel rolls….as rolls they were beyond words amazing. i can only imagine after they cool tonight….as sandwiches tomorrow! thanks! I’ve always loved soft pretzels but have been so disappointed in homemade results. However, THIS RECIPE ROCKS and it WORKS! These are so delicious. Thank you for sharing! You are welcome! Glad you liked the pretzels! I made these today and they were delicious, thank you for sharing. They stuck to the baking sheet for me though. The first four I did with no oil (on the sheet) the second four I put olive oil in the pan to grease it. It was a little better, but still stuck. Any ideas? I’d like to give these as a gift. Do you know if the cheese sauce reheats well? These look awesome! So glad I found you through Pinterest. Found this on Pinterest yesterday and tried them today. They are fabulous. My husband gave them an 11 out of 10 without the cheese sauce (and he is a everything is better with cheese/you can never have too much cheese kind of guy). I can’t wait to make them again for company. These pretzels are SO amazing, they came out picture perfect and tasted like heaven! Just made these pretzels. Yum! Thanks! Made these tonight as a practice run for a superbowl party tomorrow – they were incredible. Had to give half to the neighbor so I wouldn’t eat ALL of them. Thank you for such an easy recipe! I had no idea they were so simple. Thanks again! Glad you liked the pretzels! Have fun at your party! These would make great “buns” for pork sandwiches! Bookmarking this recipe for sure. I’ve been itching to make homemade pretzels for FOREVER! These look fabulous! The crowd of teenage boys loved these. I skipped the sauce and omitted the rosemary.m Swipe with butter, then toss on some Parmesan cheese, cinnamon sugar or just salt on. I’d consider making 16 smaller rather than 8 next time. Te are pretty big. The baking soda isn’t “in” the dough recipe. It is for boiling the pretzels. I saw these first on insockmonkeyslippers.com. Such a great combo! These are delicious. I had no idea that pretzels were boiled before baking, but these are exactly like the soft pretzels I remember. I live in Europe and had a craving for a soft pretzel and these hit the mark. Thank you for a delicious and easy recipe. The rosemary was just enough for a special flavor. This looks soooo good! I love pretzels and cheese. I don’t have a stand mixer; could the dough be achieved in a bread machine? Excellent! I halved the recipe and made dough in my bread machine, thren molded pretzels, rose, boiled and baked. I also made 8 small instead of 4 large ones. And I added flax and chia seeds. My husband loved them, and so did I! I just tried these a couple days ago and they were divine! Thanks for sharing this recipe. But I have a big question: When I took the pretzels out from the pot of water with a slotted spoon, they were pretty wet and then stuck to the wax paper. I thought it’d be OK because it is wax paper after all, but when they were done baking, all the pretzels stuck like glue to the paper. Any suggestions? Should I have sprayed the wax paper with nonstick spray? Good day! These looks good! Let me ask you, how many grams in your cup, which you measured out the ingredients? If I don’t have a stand mixer but I have a hand mixer and a food processor would it still be best to hand work the dough or should I use one of the aforementioned mixers instead? Thanks! Why all the comments on Wanting or Wishing you could make or eat these. Some of us really do cook would like to see comments by who actually made these and get tips and comments on how it came out. I hate sifting through 4 pages of blathering oohs and ahhs when you haven’t even tried to make it. Of course they look good, but hold of on typing about it until you’ve tried making it. This is a recipe blog, which implies you want to make things. 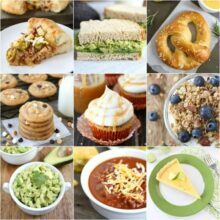 Every time I come on this blog, I always find very inspiring recipes and as usual, stunning pictures! I have to try those pretzels at home!! 1) Can I make the pretzels a day ahead? I work the morning of the Super Bowl, so I would be looking to make the pretzels the day before. Would they harden? Made these on a rare Snow Day in Georgia. They were fabulous! I used two different pans, one non – stick by farberware. They stuck to the regular pan, but lifted easily from the non stick. I will definitely make these again! Is it possible to make these with White Whole Wheat Flour?? We are trying to cut out white flour from our diets and I just wasn’t sure if you would get the same texture. These look delicious and I would love to make them! Maria, I made these today for the Super Bowl, and we are enjoying them right now, while watching the game. They are soft, warm and wonderful and taste like Heaven . The rosemary is a perfect flavor match, and I found 4 and 1/2 C of flour to be perfect. Thanks for this wonderful recipe!! I read this recipe and thought surely that 3 quarts of water is wrong and it definitely is. No one has a mixing bowl that’s a gallon big. I tried it anyway and yep, it failed. Post the right measurements please. This is a fantastic recipe! I could eat these pretzels all day. I would definitely recommend this to anyone! I use this recipe for pretzels because it’s the BEST. However today the mister cooked up a corned beef and I decided to bake your pretzel dough into slider buns…holy moly are they fabulous with brown mustard, pepper jack and corned beef!!! GREAT recipe and totally easy to make. Thank you so much for sharing it. This recipe looks amazing. I’m throwing my husband a birthday party and would like these on the menu. I’ve seen some recipes that freeze after the dough boils, before the baking step. Have you tried this? Or any other freezing methods with soft pretzels? I’d love to have all of the dishes prepared ahead of time. Thanks! Did you give any thoughts on making a you tube video on: How to make a pretzel? I go before I do wet my feet! We haven’t done any videos, but we will think about it! Thanks for the feedback! Did you need to grease the pans at all? I made some in the oven, but they stuck pretty bad to the pan. Still tasted good. I made a few on the grill without any problem though. These look so amazing! Do you think that it would be ok to do up a very large batch (for a party) of dough, boil them and then freeze to be put in the oven later, as they’re needed? I’d rather serve them fresh and warm over the course of the party but not sure if the dough will do ok being boiled, frozen, and then baked later (like a day or two later). Thanks! Yes, you can freeze the pretzels and reheat them in the oven. Enjoy! I haven’t tried it, but I bet you could keep the dough in the fridge until you are ready to roll them out and boil.